Home › Home and Kitchen › Simplypop Premium Silicone Popsicle Molds And Ice Pop Maker With Attached Lid..
Simplypop Premium Silicone Popsicle Molds And Ice Pop Maker With Attached Lid.. HEALTHY & TASTY ICE POP MAKER: What a great way to make healthy and tasty frozen popsicle treats for your family and friends! Even better and healthier than the store-bought popsicles! FUN, COLORFUL, WITH ATTACHED LIDS: Kids and adults will love the fun colors (blue, green, red, purple, pink and orange). Great for parties, playdates, or anytime at all. And there is no need to worry about losing the cap. Our SimplyPOP silicone popsicle molds come with the lids attached. EASY TO MAKE: Super easy to create your own homemade popsicles. Have the kids join in the fun! Just fill, close, and freeze! Each mold holds 2.66 fl. oz (1/3 cup). Slim design saves space in the freezer. Also great for on-the-go snacks or to pack in lunch boxes. Can be used to pack snacks such as nuts and dried fruit. EASY TO CLEAN AND DISHWASHER SAFE: All you need to do is clean with warm water and soap. Your SimplyPOP silicone popsicle molds are dishwasher safe too! PREMIUM QUALITY: SimplyPOP Popsicle Molds are 100% Food Grade Silicone, BPA Free, and meets FDA Standards. Limited Time Promotional Offer!! 35% off Retail Price! Also, buy 2 or more and get a 10% discount on each SimplyPOP product. SelectQty 2 or more, click "Add to Cart" and enter promo code FDSUAQ3R at checkoutto save! Easy to Use, No Mess, Silicone Popsicle Molds with Attached Lids Our silicone ice pop makers are an easy and no mess way to make the perfectice pop. Moms will love the no drip, no mess design. Kids will love eatingtheir frozen treats from the fun, colorful popsicle molds. So many benefits of the SimplyPOP Popsicle Molds... Healthy alternative to store-bought popsicles Make cool, frozen treats with yogurt, fruit smoothies, juice, and ice cream.The options are endless! Or use them to store other snacks! 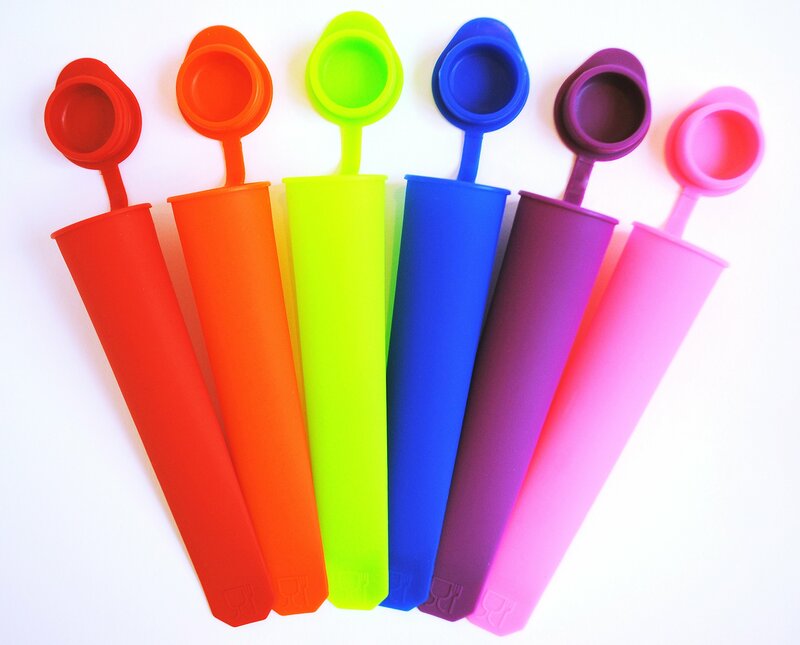 Comes in a set of 6 colorful popsicle molds with attached lids Slim design saves space in the freezer Easy to clean and dishwasher safe 100% Food Grade Silicone, BPA Free and meets FDA Standards Tips for Use Before first time use, wash the popsicle molds with warm water and soap. When filling the popsicle molds, make sure to leave room on the top as thecontents will expand during freezing. When freezing, ensure that the lids are secured tightly before freezing.Popsicles can be frozen on its side or standing upright, wherever you haveroom in your freezer! After taking the popsicles out of the freezer, run the popsicle molds underwarm water for a few seconds to loosen up the contents. Temperature Range: -40F~450F/-40C~230C Buy SimplyPOP products with confidence 100% Satisfaction Guarantee - If you don't love your SimplyPOP Popsicle Molds,for whatever reason at all, you can simply return it and we will refund yourmoney right away. No questions asked!